At present, an increasing number of individuals are becoming more and more health-conscious and are looking forward to leading a healthy and balanced lifestyle. However, in spite of all these aspirations, they might find it quite hard to stay away from the delicious treats out there, particularly the fried ones. For example, we all enjoy consuming fried chicken as well as French fries and might find it extremely hard to give them up. Fortunately, due to a remarkable advancement in technology, individuals these days nevertheless enjoy having fried food items without frying them in lots of oil or adding a surplus amount of spice as well. This has been possible due to the introduction of air fryers on the market which helps us to minimize our fat intake without any need of giving up our favorite items whatsoever. Moreover, all these devices are adept at preparing the recipes quite fast as well. Below, we will mention the breathtaking Air Fryer XL Touchscreen manufactured by Cozyna Air Fryer which can prove to be a fantastic gift for any fitness buff out there. In fact, this appliance can be used as a fantastic kitchen accessory regarding which the owner should feel proud of. On top of this, it is ideal for preparing almost anything from baking cakes, burgers, roasting vegetables, not to mention frying up some scrumptious chicken. Moreover, it is quite easy to use this device which offers all the basic features you will need to prepare your food in an absolutely hassle-free manner. It comes with an incredible 5.5 capacity and its price tag happens to be $119 which is not that much when compared to the features offered by this device. 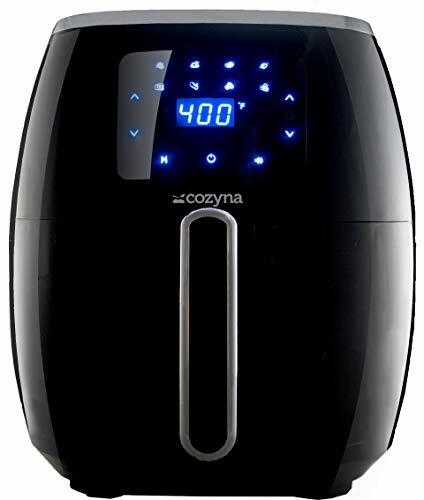 This awesome product from Cozyna provides us with all the necessary settings as well as options that one will require to prepare fried food items in a breeze. In this way, it will be possible for anybody to satisfy his or her taste buds without adding any excess calories whatsoever. This cutting-edge air fryer comes with as many as 8 preset functions, namely, chicken, fish, chicken wings, steak, grilled cheese, potato, fries/chips, not to mention BACON. It will be possible to select from any of these options or you can even set your own personal temperature and time. This preset buttons can make the process extremely easy and fast with only the touch of a single button. This amazing device has the ability to hold as much as 5.5 liters which really makes it one of the most coveted air dryers on the market at present. In fact, hosting dinner parties was never so easy without the Air Fryer XL Touchscreen which allows you to prepare food for up to 8 people at any given time. You simply need to position your food within the basket, add some oil and set your own temperature as well as time. That’s all! This revolutionary device is perhaps the healthiest substitute when it comes to deep frying given that it makes use of innovative air circulation technology and needs only one tablespoon of oil. This implies that you’ll be consuming at least 70% less fat on an average while still savoring all of your preferred food items including fried, baked, grilled, as well as roasted foods. In this way, you’ll be able to enjoy the best of fried items without frying them in too much oil. The manufacturer is going to offer a lucrative 60-day cash back guarantee in case you aren’t satisfied with the product. This implies that you can easily try this Cozyna Air Fryer by paying the actual cost and prepare different types of food items without any risk at all. All of your money will be reimbursed to you provided you do not feel okay with the product. In a broad sense, this product happens to be a combination of a fryer, grill, and oven all in just one unit. This will enable you to easily bake, fry, roast or even grill your preferred foodstuff with just one appliance. It will be possible to select from as many as 8 touch presets and you might even set your personal temperature and time settings. Moreover, in case you would like to experiment more, it will be prudent to take a look at the cookbook that comes bundled with the product. In fact, you’ll come across more than 50 mouthwatering recipes out there. In this way, this air fryer is perhaps the healthiest method of cooking all your preferred food items using just one appliance. The facility of as many as 8 custom presets does help to make your mealtime enjoyable and fun. It is as good as getting your food prepared by an experienced chef out there. 8 inbuilt cooking presets: from French fries to Bacon at the touch of a single button. Grills, fries, roasts, and bakes using only a teaspoon of oil. Temperature can be adjusted up to 400. Comes with a couple of cookbooks having in excess of 50 recipes. 100% dishwasher safe which makes it very simple to clean the device. 1. Innovative and useful touch panel. 2. Provides extremely high wattage. 3. Comes with a basket which remains secure within the drawer while sliding to and fro. 1. Somewhat expensive as compared to the other similar items on the market. After going through the above discussion, it must now be clear to us that this remarkable Cozyna Air Fryer XL will deliver fantastic results when it comes to enjoying scrumptious food items. In fact, this product is appropriate for the entire family, and also for hosting any party. It will be possible for you to whip up any kind of food you like for satisfying your taste buds as well as those of your near and dear ones. Moreover, all these food items will be prepared with minimal hassle and, of course, without any excess oil or even fat. In a nutshell, it is a product which every modern household ought to own at present.